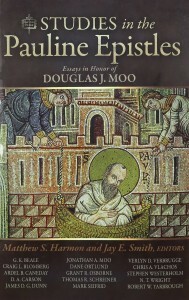 Studies in the Pauline Epistles is put together by Matthew Harmon and Jay Smith and includes a stellar lineup of scholars contributing essays in honour of Doug Moo inspired by his interests. Ardel Caneday begins by arguing that Romans 5:17 (“will … reign in life”) does not speak of the believer’s future dominion over creation (as in Romans 8), but rather “the believer’s present dominion over sin in these mortal bodies” (p28) as developed in Romans 6. Chris Vlachos suggests that the believer’s freedom from the law “occupies a seminal place in [Paul’s] teaching regarding moral transformation” (p48) and thus unpacks the implications of being free from the law. 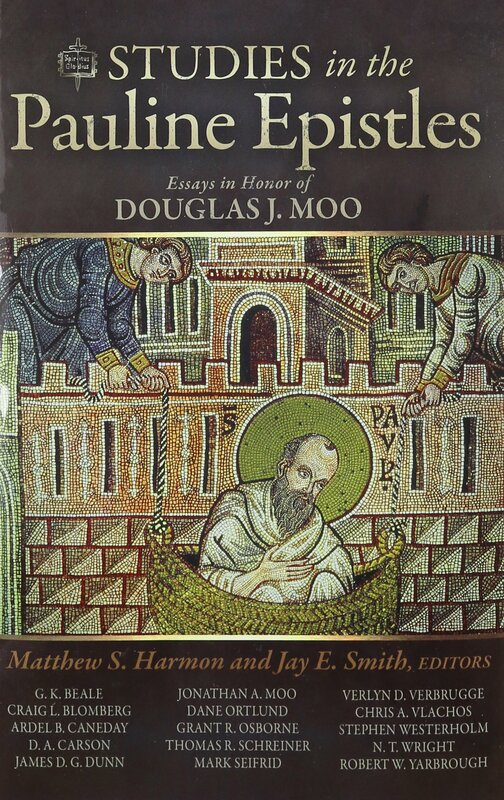 Doug’s son Jonathan Moo investigates 1 Corinthians 4:15-16 to find “what in his relationship with the Corinthians Paul intends to highlight as he uses the parent-child metaphor” and “what Paul’s comparison reveals about how he conceives of family life…and life in the family of God” (p61). Scholars agree that Paul quotes the Corinthians’ own words back at them throughout his first letter, and Jay Smith wants to add one more phrase to the list: “all other sins a person commits are outside the body”. D. A. Carson focuses on Galatians 2:11-14 and “reflect[s] a little on some of the mirror-reading that goes into every interpretation” (p99) and proposes as solution that he sees as making best sense of the evidence. Verlyn Verbrugge gets his elbows dirty in suggesting a translation of Philippians 2:12 that recovers an “important nuance” (p116) that other translations have missed. Moving to part 2, Craig Blomberg applies Richard Hays’ methodology for detecting OT allusions in Paul’s letters allusions to the Jesus tradition, summarizing likely allusions in Paul’s letters and suggesting a few new ones (e.g. Matt 19:28 in 1 Cor 6:2, Matt 19:1-12 in 1 Cor 7:10-11, Mark 9:42 in 1 Cor 8:13 and Matt 10:10 in 1 Cor 9:14). Matthew Harmon tackles the ever-controversial “allegory” in Galatians 4:21-5:1 to discover Paul’s own hermeneutics, arguing that Paul’s “allegorical” use is better understood as typology that is faithful to the text’s original meaning. Grant Osborne displays his humility and care as a scholar by retracting his previous view of Psalm 68:18 in Ephesians 4:7-10 and proposing a new understanding. Part 3 begins with Robert Yarbrough “revisit[ing] the promise of salvation history in interpreting the Pauline writings” (p181), surveying its history, its detractors and its value. G. K. Beale argues that Paul’s understanding of resurrection, the Holy Spirit, justification, the Law, and ecclesiology are all shaped by his eschatology. The next two entertaining articles have James Dunn having “little difficulty” (p214) explaining what the Old Perspective on Paul gets right and Stephen Westerholm what the New Perspective gets right. N. T. Wright takes the NIV (and Moo by extension) to task for the interpretation of δικαιοσὐνη θεοὒ (the righteousness of God), and raises some implications for the “apocalyptic” movement in Pauline scholarship. Thomas Schreiner “think[s] briefly and in a survey fashion about what Paul says about truth and our ability to perceive and grasp it” (p259). Lastly, Mark Seifrid offers a closing essay in gratefulness to Doug Moo. As is always the case with books like this, one’s enjoyment and appreciation will vary. Most are quite specific, so their usefulness is subjective. If any of the articles sounds intriguing or useful then it is certainly worth reading. Having read each of the articles, I can testify that they are all quality. Not only are the scholars top-notch, but the diversity here particularly encouraged me: we have Carson and Westerholm, but also Wright and Dunn. The editors should be congratulated on managing to bring this motley crew together. Having articles on the Old and New Perspectives on Paul by antagonists was especially genius. Though it is impossible to pick a standout chapter, D. A. Caron’s chapter was particularly enlightening and enjoyable. It was a carefully reasoned and articulate piece of writing that proposed a compelling reading of a difficult passage with an overwhelming number of interpretative options available. Studies in the Pauline Epistles is recommended for any audience interested in the subject matter of the articles or even Pauline studies in general. It is a collection of fine contributions and the calibre and diversity of scholars desiring to esteem one of their own does him an honour. Many thanks to Zondervan Academic for providing a copy in exchange for an unbiased review.